Apparently, this is the luxury car of the future ... We aren't so sure. What is it: The first fresh concept from Aston Martin in its (second) revival of Lagonda, timed to celebrate the British marque's 100th anniversary. Highlights: Apparently, you can't use Aston Martins all year round in some countries, and the luxury performance car maker thinks it is missing out on sales in these less-hospitable but sometimes quite cashed-up climates. Re-enter the Lagonda, another Brit brand from the early 1900s that Aston has once before taken under its wing - though this was back in the bigger -is-better Eighties, and its shape and appeal was not as timeless as the DB Astons (though the 1993 Lagonda Vignale was not a bad attempt). The Lagonda concept is actually a crossover sedan built on a Mercedes-Benz GL chassis, and apparently able to tackle the sludge and snow of countries like Russia, where only Bond himself is brave enough to drive in the depths of winter. Ignore the stilts for increased wheel articulation, and the overall silhouette is quite stately, and maintaining luxury flagship musts like a huge V12 engine and 22-inch rims gives it some cred amid the Bentley and Roller crowd. 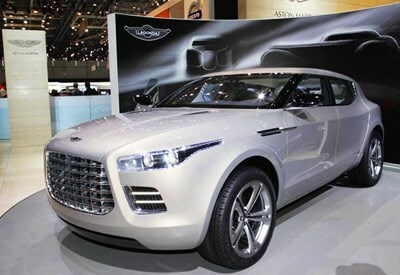 Aston Martin CEO Dr Ulrich Bez said "The Lagonda is the luxury car of the future." "The Lagonda is the luxury car of the future," says Aston Martin Lagonda Chief Executive, Dr Ulrich Bez, "a combination of total usability, a new form and innovative new technology and materials." "An Aston Martin is an authentic, pure sports car," says Dr Ulrich Bez, "but Lagonda is something else, a new brand that will reach into new markets. Lagonda will create a new kind of customer relationship, instilling the spirit of travel, adventure and style into a single, formidable package.